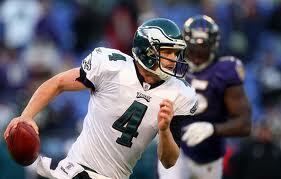 Fantasy Football Sleeper: Philadelphia Eagles QB Kevin Kolb - Fantasy Football, Fantasy Football Rankings | Mac Bros. He has all the intangibles to go along with adequate arm strength, much improved accuracy and above average athleticism for a QB. Kolb can make just about any throw that is asked of him, both deep and short, and he is fleet of foot enough to escape from the pocket for a few yards when necessary. While Kolb is likely to experience a few growing pains in his first full season as the Eagles starting signal caller, he has already displayed the ability to become a top tier fantasy QB. In two regular season starts last season, Kolb averaged 359 passing yards and 2 TDs per game. A pass happy offensive philosophy, a solid offensive line and all pro caliber targets in DeSean Jackson, Jeremy Maclin and Brent Celek should provide Kolb with all the necessary ingredients for success in 2010. In addition, the Eagles are expected to feature a quality running attack led by second year RB LeSean McCoy which should go a long way in helping open up the passing game. Kolb still has plenty to prove and will be viewed as an undervalued back up in many fantasy drafts, but don’t be surprised if he quickly transcends into QB1 material capable of putting up numbers that rival some of the best QBs in the league. If you are looking to load up on RBs and WRs early in your fantasy draft and you like to gamble on a starting QB in the middle rounds, Kolb is your man. There is some obvious risk involved with that strategy, but Kolb could easily turn out to be the steal of 2010 fantasy drafts. Each week The Mac Bros. (Rich and Rob) offer up free fantasy football picks. Find out who to start and who to bench, complete with rants, raves and news, from two fantasy football champs.